Take a Caribbean vacation while at Disney World! This charming resort will put you on a tropical island complete with white sand beaches. There are 33 two story buildings which house all 2112 guest rooms. 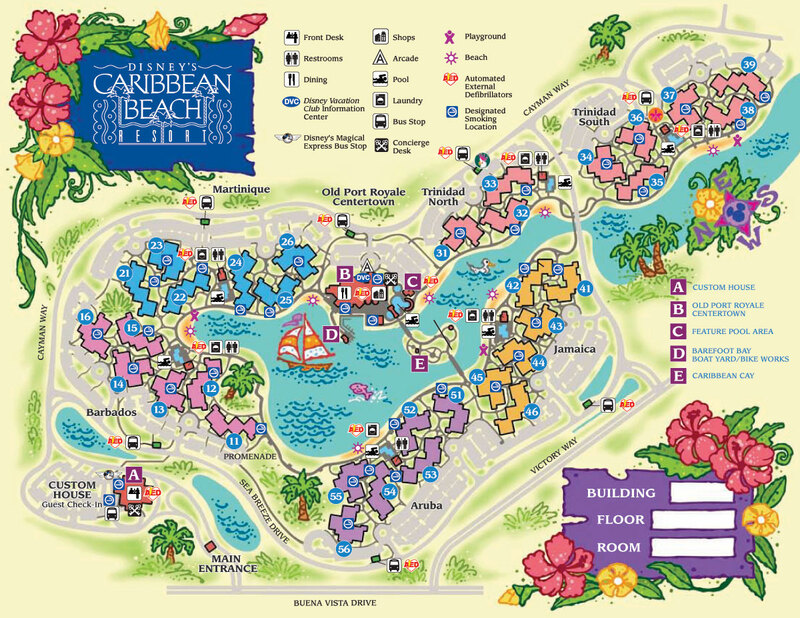 The “Villages” of buildings bearing Caribbean inspired names such as Trinidad North and South, Barbados, Jamaica, Aruba, and Martinique, are situated around the shores of the 45 acre Barefoot Bay. Each village has its own beach (You can enjoy the sand and the view but cannot swim! ), pool, laundry, bus stop, playground, and hammocks. Old Port Royale is the activity hub of the resort housing all the dining, shopping, arcade, Barefoot Bay Marina and Bike Works for recreation rentals, and is home to the largest pool at the resort. Some resort rooms are quite a distance to this area so if you want to be close by to food and recreation you may consider paying for a preferred room. The Custom House is the main entrance and guest check in. You will also find magical express and airline check in here. Market Street Food Court is a quick service food court located in Old Port Royale. Market Street is open from 6am-Midnight daily with offerings such as waffles and bagels for breakfast and Pizza and sandwiches and items from the grill for lunch and dinner. Shutters at Old Port Royale is a table service location offering Caribbean style fare such as jerk crusted tuna, Caribbean braised beef, and Aruba style roast chicken. Banana Cabana is a poolside bar located at the main pirate themed pool. Grab a tropical drink to make your stay at the Caribbean Beach Resort complete. Shopping at Calypso Trading Post and Calypso Straw Market for incidentals and souvenirs. Transportation to all Disney Theme Parks and Down Town Disney is available. There is a bus stop at each village and one at Old Port Royale. The buses run regularly, but you may have a bit of a walk to the bus stop. Quick Review: This is a fun budget friendly option for families and honeymooners. This is a big resort so make sure you understand the layout when booking. 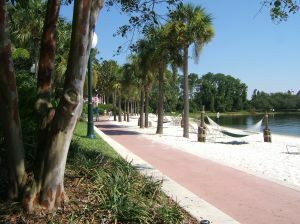 This entry was posted in Moderate Resorts, Resort Spotlight, Uncategorized and tagged Banana Cabana, Boat Rental, Caribbean Beach Resort, Marina, Old Port Royale, Shutters. Bookmark the permalink.